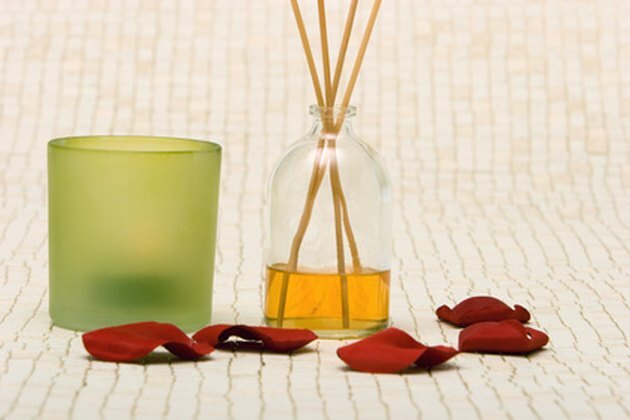 Essential oils for aromatherapy can be mixed with several substances, including other "carrier" oils, lotions, certain vinegars and even alcohol. Isopropyl alcohol, more commonly known as "rubbing alcohol," is a denatured substance, meaning it cannot be consumed. It is safe to apply to skin, however. In fact, isopropyl alcohol is used as a disinfectant at medical facilities to clean skin prior to taking blood, giving an IV or administering a shot. Its use for aromatherapy purposes is more questionable. Essential oils are most commonly diluted with carrier oils. Dilution with alcohol or apple cider vinegar is considered alternative systems, advises Roberta Wilson, author of "Aromatherapy: Essential Oils for Vibrant Health and Beauty." However, Wilson specifically recommends against using isopropyl alcohol. Ethyl alcohol, which is pure grain alcohol, vodka and brandy can be mixed with essential oils and applied to a person's skin. The alcohol evaporates after 30 seconds to one minute. Isopropyl alcohol does play a role in aromatherapy-as the antiseptic of choice for containers, tools and surfaces. For example, the Aromatherapy Place favors isopropyl alcohol for this use, citing its effectiveness against vegetative bacteria. Isopropyl alcohol has been used as an aromatherapy agent by itself. A 2004 study published in the "Journal of Pre-anesthesia Nursing" found that aromatherapy with isopropyl alcohol was equally effective as therapy with peppermint oil in reducing nausea after surgery. However, a placebo of saline had the same effect as the aromatherapy, suggesting that controlled breathing patters have more to do with the benefit than the actual aroma the patients inhaled, according to study authors L.A. Anderson and J.B. Gross. Patients inhaled through their noses and exhaled slowly via their mouths. When isopropyl alcohol is used as an aromatherapy treatment for nausea, a patient can gain relief but be left with a negative emotional reaction, according to Wendy S. Nichols' "The Use of Essential Oil Therapy for Treatment of Post Operative Nausea and Vomiting." The reaction occurs because the smell reminds a person of unpleasant experiences like dental visits or intravenous insertions. Smelling a pleasant aroma, on the other hand, can spark a positive emotional reaction. Essential oils are more often diluted with propyl alcohol as opposed to isopropyl alcohol. These alcohols are isomers, meaning they have the same atoms but that these atoms are arranged differently. Isopropyl alcohol is less toxic, less dense and has a lower boiling point than propyl alcohol. It also has a stronger smell, as propyl alcohol has virtually no odor. Propyl alcohol has a lower flash point. Its flammability has caused hazards in some countries such as Taiwan because essential oils sold there often are diluted up to 90 percent with this alcohol and sold as "pure." Many people have suffered serious burns because they put these diluted oils on hot light bulbs, in oil lamps or in shallow dishes over candles, according to "The Chemistry of Essential Oils Made Simple," by David Stewart.